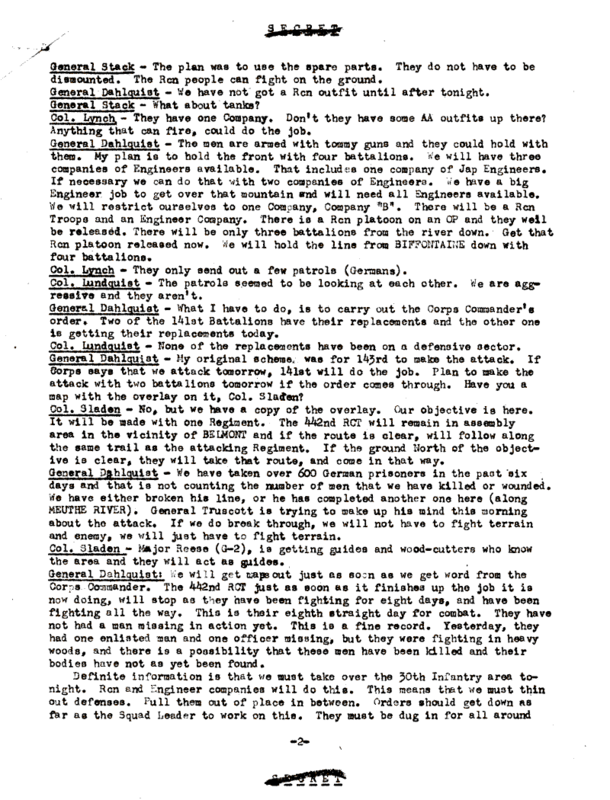 Document Notes: Report of 36th Division commander's conference of Oct. 22, 1944. Covers division actions that month to date and explains the situation facing the division for the remainder of the month. The 442nd RCT was attached to the 36th Division. On page 2 the CG compliments the 442nd for its performance during 8 days of hard fighting prior to the 22nd. The report is significant for several reasons. First, it describes the conditions at the time. Second, it records the hard fighting by the 442 for eight days. Third, losses in this fighting are often attributed to relieving the "Lost Battalion," which is incorrect. The so-called Lost Battalion was not yet lost. Finally, it gives a pretty gritty picture of the fighting in that area at that time.